I know you hate being criticized. Everyone does. But you don’t have to take it personally or even seriously every single time. Criticism is not something that should keep you from doing what you’re doing. The truth is there will always be people who want to stop you just for the sake of it. 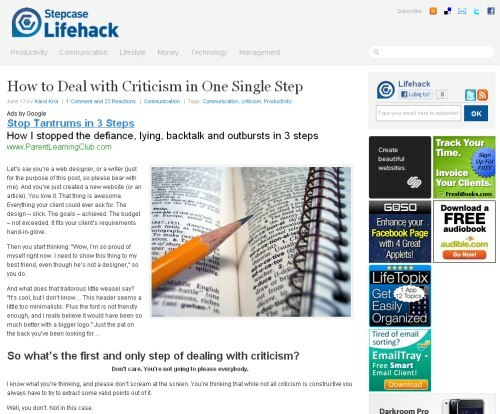 Sometimes you can deal with criticism in just one single step… check out my guest post at Lifehack.org to find out how. Focusing too much attention on absurd criticism destroys your productivity even more than answering emails does. I guess what I’m trying to say is that perfection is not such a brilliant idea as it may seem. P.S. If you need some inspiration on having the right mindset check out what the Achuar Tribe can teach you about overcoming obstacles.